Our mission this year at Stan Lee’s LA Comic-Con was a greater success than we could ever have planned for. Hardly Heroes went above and beyond. Tim Munsey popped our eyes. Beth Izard bedazzled everyone. Stephen Costantino kept the spirits high. The Tates were wonderful hosts to Team Annie Bananie. The Black Eyed Peas were very inclusive, and gave us the purple carpet treatment. Flavor Flav was loved by everyone. The Price is Right people made Annie and Lucas prime time contestants. 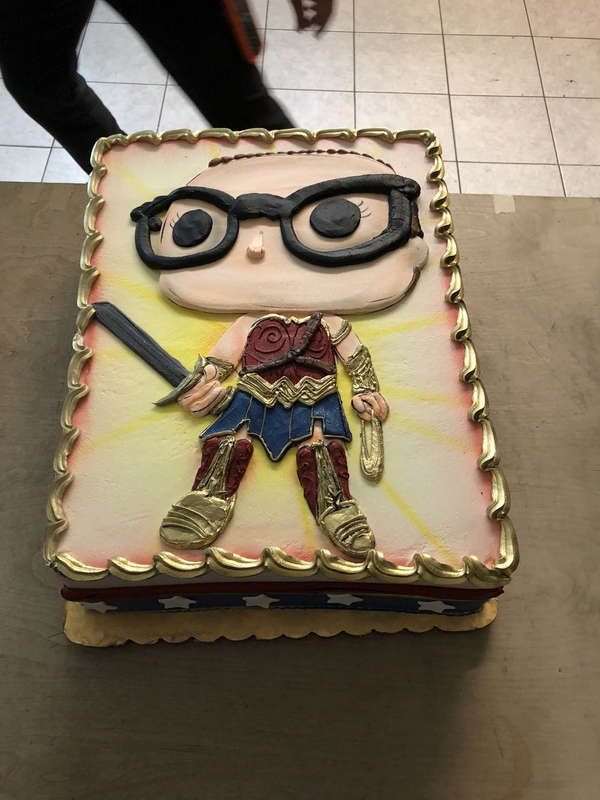 The 501st Legion, Camilla d’Errico, Frank Mastromauro, Mars Crain, Krystle Starr, Cosmunity and various cosplayers helped celebrate Annie’s birthday. 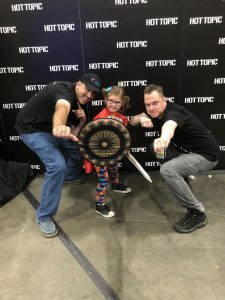 Hot Topic was again so very gracious in their giving, and making this little cancer warrior into Wonder Woman! The final greatest hit was the one on one with Stan Lee! Friday started with booth set-up, it was chaotic wild energy getting everything ready. Hardly Heroes, Tim Munsey, and Project Wish were all working different parts of the booth each running around each other trying to get everything ready for the doors to open at 1pm. From 1 – 4, we tried to take in the show. At 4 pm, the Blakes arrived on the scene. And what a scene. Annie and Benjamin got a ride in a wagon that was decked out in Team Annie banners. We pulled them through the crowd, making a grand entrance at the booth. We introduced Annie to Star the Cow, who in her own right became one of the stars of the show. Darren then presented Annie with her own key to Annie’s Superhero City! He then walked her down the purple carpet to the world that was specially built for her! 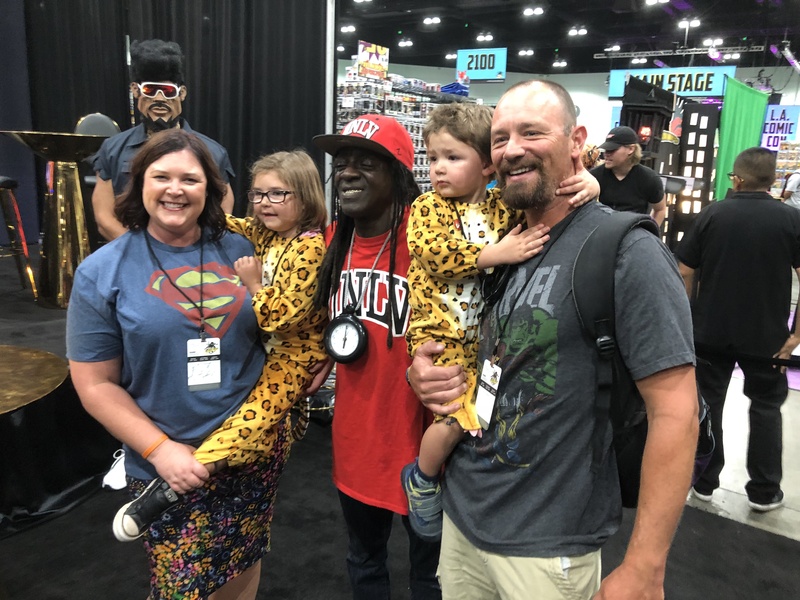 Flavor Flav heard what was going down, and had us come to the Black Eyed Peas’ booth to say hi, and gave out hugs to everyone, especially Annie and her mom. Darren and Vern went to the Price is Right booth to set up a chance at the wheel for the Project: Superhero! kids. 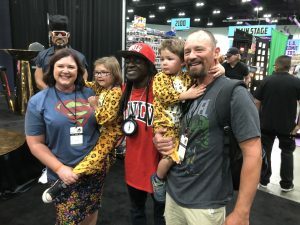 While they were gone, the Black Eyed Peas came to our booth to give love to everyone. The first day ended at 4pm. Saturday started at a more relaxed pace. Darren and Vern spent a lot of the day gathering Cosplayers for Annie’s Sunday Surprise Party. They also made contact with Nichelle Nichols, Walter Koenig, and Krystle Starr of Cosmunity. 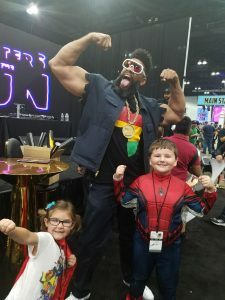 The booth had a constant flow of traffic, in equal parts due to Star the Cow and the Black Eyed Peas signing in the booth across the aisle. Sunday, the focus was Annie’s Birthday Party!! We bided our time until the noon launch of her birthday party. Then, BAM! out came the cake, the cosplayers, all of our special guests, and the presents for Annie. The Black Eyed Peas even stopped the music long enough for us to sing “Happy Birthday”. At 1 o’clock Annie and Lucas went to spin the Price is Right big Wheel. 2 o’clock came around, and it was time for Hot Topic Red Carpet. Hot Topic transformed Annie into Wonder Woman, gave her Wonder Woman’s sword and shield, plus a couple dozen Limited Edition Funko products. William Smith and HT always go above and beyond for our kids! After that, we took some time to relax at the booth. 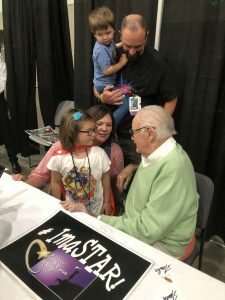 Just before 4 o’clock, and closing time, we hauled ourselves to Stan Lee’s booth to meet the Man. Stan was very gracious and kind to Annie, even commenting that she looked like his own daughter. Darren presented Stan with a star that was custom etched by Tiffany & Co for all that Stan has given through the years.